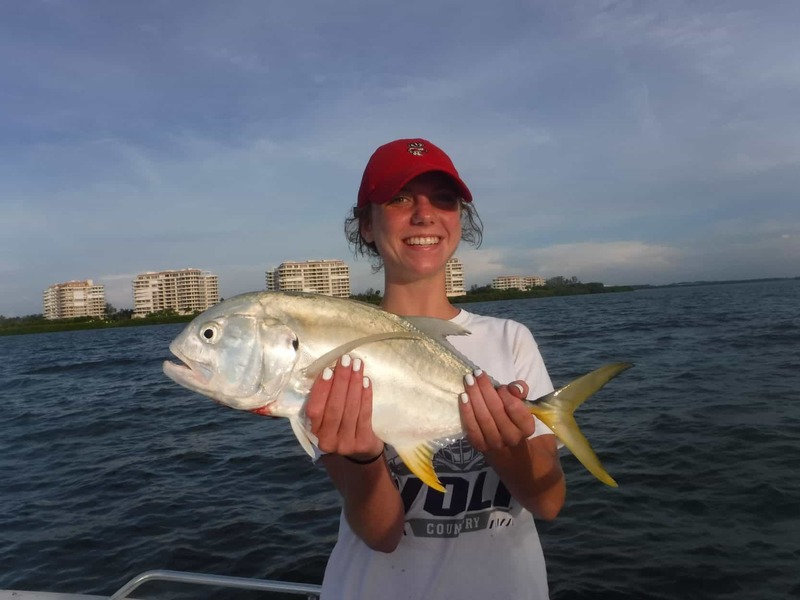 Anglers fishing Sarasota Bay have the opportunity to catch over 20 saltwater fish species. Multiple techniques are effective. Sarasota Bay can fished all season long. Sarasota Bay is on the West Coast of Florida. It runs northwest to southeast and sits south of Tampa Bay and North of Charlotte Harbor. Sarasota Bay is roughly 10 miles long and 3 miles wide and is fairly shallow. It has many acres of submerge grass beds which hold fish. Other excellent habitat includes mangrove shorelines, creeks, and passes. 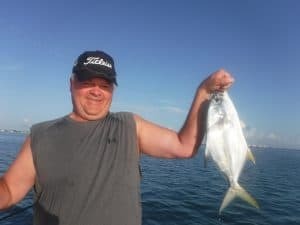 Sarasota Bay can offer excellent fishing all year long! This fishery actually extends another 10 miles or so south. Roberts Bay and Little Sarasota Bay are narrower. The character of these bays is a bit different as well. Grass flats are less plentiful while oyster bars are the primary habitat. Docks in both the bays and in residential canals and creeks offer fish sanctuary as well. Sarasota Bay is home to many inshore saltwater species. 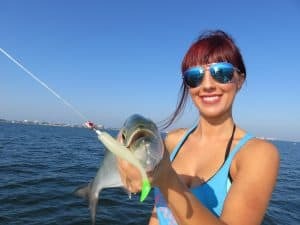 Snook, redfish, speckled trout, Spanish mackerel, bluefish, pompano, jack crevelle, ladyfish, cobia, sharks, tarpon, red and gag grouper, mangrove snapper, sheepshead, Key West grunts, flounder, black drum, whiting, catfish, and black sea bass are some of the more popular species. Tackle used for anglers fishing Sarasota Bay is pretty basic. A 6 1/2 foot to 7 foot medium action spinning rod with a 3000 series reel spooled up with 20 pound braid or 10 pound monofilament line is the best all round rig. Anglers then attach a 24 inch piece of 30 pound fluorocarbon as a shock leader. The lure or hook is then attached to the end of the leader. While every year is different, seasonal patterns hold up over time. A cold winter will find fish in the deeper holes as well as in creeks and residential canals. Fish on the grass flats tend to be a bit deeper, in a to 10 feet of water. Several days of warm weather may have them up on the shallower flats. Residential canals and creeks will hold a lot of fish in cold weather. They also offer anglers some refuge from the wind. Docks in these areas will attract and hold fish. They offer shade, structure, and forage. Anglers fishing live and frozen shrimp under docks will catch sheepshead, black drum, snapper, snook, redfish, and jacks. Anglers targeting snook in jacks will do well in the upper end of canals as well as several creeks in the area. Phillippi Creek, Hudson Bayou, Whitaker Bayou,Bowlees Creek, in the grand Canal on Siesta Key are but a few of these types of areas. The best approach is to cast a search bait such as a shallow diving plug. Trolling the same plugs can help locate fish. As it warms up in the spring, fish will move out of these deeper sanctuary waters and scatter out over the flats. They will be active, aggressive, and in the mood to feed. 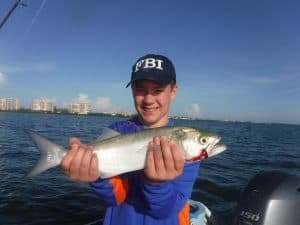 All of the deeper grass flats in 4 feet of water to 10 feet of water should hold speckled trout, ladyfish, bluefish, Spanish mackerel, pompano, and more. Snook, redfish, jacks, and large speckled trout will be found on the shallow grass flats, around oyster bars, and along mangrove shorelines. Artificial lures are usually the bait of choice as they allow anglers to cover a lot of water in search of these game fish. Live bait can certainly be used as well. Both Big Sarasota Pass and New Pass are very productive spots in spring. 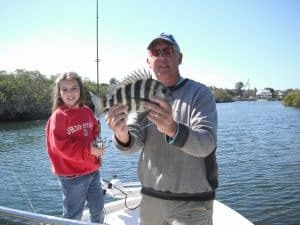 Anglers fishing Sarasota Bay passes will find the sheepshead schooled up heavily on structure. Mangrove snapper and gag grouper will be mixed in with them. They show up in late February and usually stay until April. Pompano, Spanish mackerel, bluefish, and ladyfish will be caught in the passes themselves. 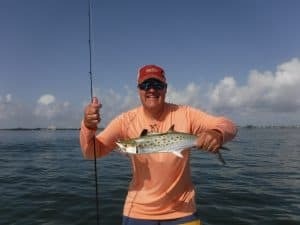 Summer offers anglers fishing Sarasota Bay outstanding action! Many visiting anglers are surprised to learn this, as many times fishing slows down in the heat of summer. The key to the summer action in Sarasota is the abundance of live bait. Small forage fish such as scaled sardines and threadfin herring are plentiful on the grass flats near the passes. Anglers fishing and summer do need to get up early. The best bite is first light and it gets hot awfully fast. The deeper grass flats provide great action on a variety of species during the summer. Anglers can use live bait or artificial lures. Night fishing is another way to catch fish while escaping the heat of the Florida sun. Snook will migrate into the passes and out along the beaches and summer. 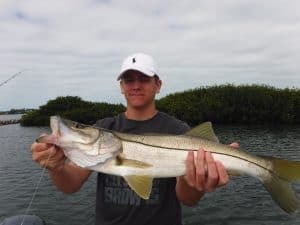 Anglers can sight fish snook on all of the Sarasota beaches. Structure in both passes will hold plenty of fish as well. Live bait is usually the best approach for fishing for snook in the passes. Fall is a great time for anglers to be fishing Sarasota Bay. The kids are back in school and the tourist traffic in Sarasota is low. The weather is usually quite reliable in the fall as well. Spanish mackerel will be migrating back south. Fishing the flats will pick up is water temperatures drop. Snook, redfish, and jacks will be found in the same places as they were in the spring time. Shallow flats, mangrove shorelines, docks, and oyster bars are good places to target these fish, particularly in Roberts Bay and Little Sarasota Bay. As fall comes to a close and it gets cold, fish will move back to their winter haunts and the pattern will repeat itself. Anglers fishing Sarasota Bay who seek action and variety will do well to target the deep grass flats. By “deep grass flats”we are reference submerge grass beds that grow in water between 4 feet deep and 10 feet deep. These grass beds hold bait fish, shrimp, and other crustaceans that the game fish feed on. When the water is clear, these areas are easy to see. The best approach when fishing the deep grass flats is to drift. These can be large areas without any specific structure. Therefore, fish will roam about on the flats in search of food, anglers drifting cover more water and have a better chance of locating feeding fish. Speckled trout are the primary species targeted on the deep grass flats. However, Spanish mackerel, pompano, bluefish, jacks, ladyfish, and other species are encountered regularly as well. Both artificial lures and live bait are very productive when drifting the deep grass flats. Anglers fishing Sarasota Bay who prefer live bait will do quite well using live shrimp. Shrimp are available at bait shops all season long. A live shrimp under a popping cork has produced a lot of speckled trout over the years. The technique uses a noisy cork or float to attract the fish. Once the noise draw them in, they eat the live shrimp dangling there. On the deeper grass flats, free lining the shrimp often works better. Live bait fish are used on the deep grass flats as well, particularly in the warmer months. 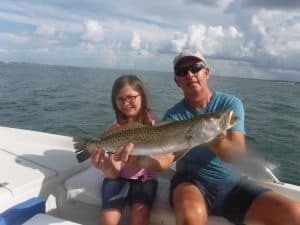 A live 3 inch pin fish or grunt floated out behind the boat under a cork will catch some of the larger trout as well as perhaps a stray cobia. Live bait chumming is incredibly effective in the summer. The bait well is loaded up with live baits than they are used to attract game fish behind the boat. The number one artificial lure for anglers fishing Sarasota Bay is without a doubt the jig and grub combo. It is a simple, cost-effective, ineffective lure. It consists of a lead head jig. This is a hook with a piece of lead near the eye. The weight provides both casting distance in action to the lure. One quarter ounce is the best all round size. White, red, and chartreuse are the most popular colors. Some type of plastic body is then put on the jig hook. These grub bodies come in endless colors, sizes, and styles. They all imitate either a crustacean or a bait fish. Shad tail baits are very popular as a have their own built in action. Paddle tail and shrimp tail baits work as well. 3 inch to 4 inch baits are best for anglers fishing Sarasota Bay. The jig and grub can be worked in a couple different ways. The best approach is usually a “jig and fall”retrieve. The lure is cast out, and allowed to sink several feet in the water column. It is then brought back in by twitching the rod tip sharply then adding some slack. This results in the jig jerking up quickly than falling helplessly back down. This action triggers a lot of strikes. Jigs can also be cast out and reel steadily back to the boat. Plugs and spoons are also effective lures on the deep grass flats. These lures work very well when “breaking fish”are seen. These are schools of fish that are feeding on helpless bait fish on the surface. They can be seen splashing about as they feed. Bird activity is often a great indication of breaking fish. A fast, erratic retrieve usually works best. Anglers fishing Sarasota Bay on the deep grass flats can also troll. This technique works well on days when there is little wind to provide a drift for the boat. It is also a good technique for novice anglers and children with perhaps less than ideal patience. Plugs work very well for this. The Lord is simply cast out a ways behind the boat and then the boat is idled along until a fish bites. 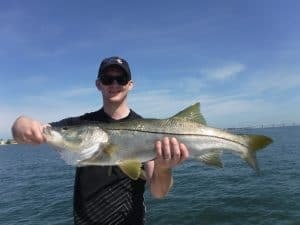 Anglers fishing Sarasota Bay in search of snook, redfish, jacks, and gator trout will do well to target the shallow areas. It perplexes some anglers to learn that the largest fish are often caught in the shallowest of water. For the most part, these fish are loners. While the smaller fish are not comfortable in the shallow water the larger fish are. Tactics are different for anglers targeting fish in shallow water. These fish can be spooky and a quiet, stealthy approach is required. Anglers that lighten up their tackle will be more successful. Long, accurate casts are often times required. Most anglers choose to use artificial baits in shallow water. Lures are easier to keep out of the grass and are more effective when searching for fish. Jigs, spoons, and plugs are all effective baits on the shallow flats. Light jig heads in the 1/16 ounce to 1/8 ounce range are best. Anglers can use buck tail jigs as well as a jig head with a soft plastic body. Longer trailer such as a six-inch jerk worm tend to work well. Jigs remain relatively weedless as a rod with the hook up. Weedless spoons are a staple of shallow water anglers all over the country. These lures cast a long way, run shallow, and are fairly weedless. They are particularly effective for redfish. Spoons are great search baits. Gold is the preferred color in 1/2 ounce is the most popular size. Passes connect Sarasota Bay with the Gulf of Mexico. Pass is just another word for an inlet that they use on this coast. 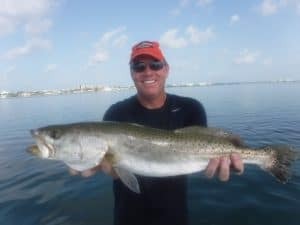 Anglers fishing Sarasota Bay can experience excellent action in the passes. Ladyfish are often times thick right in the pass itself. This is great fun for children and novice anglers as the action can be virtually nonstop. Pompano, mackerel, bluefish and other species can be taken in the middle of the passes. Vertical jigging while drifting the passes works very well. It is also quite simple to do. The angler simply drops the jig down to the bottom, engages reel, then gives the jig little 1 foot hops as the boat drifts along. Most of the fish in the passes will be feeding on crustaceans on the bottom. This jigging action mimics a fleeing crab or shrimp and is very productive. A jig head with a live shrimp can be used as well. Structure in both Big Sarasota Pass and New Pass hold fish all year long. In the winter and early spring, sheepshead will school up thick in the passes. A live or frozen shrimp fished on the bottom will catch them, as well as other species such as grouper and snapper. In the summer, snook will school up in the same rocks. Docks and bridges are basically inshore artificial reefs. Anglers fishing Sarasota Bay target them for a variety of species all year long. Most anglers use live or frozen bait when fishing docks and bridges. However, artificial lures can be used as well. The most productive approach when fishing a dock or a bridge is to anchor up current from the structure about a cast or so away. The bait is then cast out towards the pilings and allowed to sit. Live shrimp, frozen shrimp, cut squid, cut bait, and live bait fish can all be used. Sheepshead, snapper, drum, grouper, flounder, snook, redfish, and other species will be taken. Anglers using artificial lures to fish docks have success using both plugs and jigs. Plugs allow anglers to cover a lot of water fairly quickly. A lower that dives down 3 to 4 feet is perfect. 3 inch to 4 inch baits in olive and white match the local forage. Shad tail baits on a 1/4 ounce jig head will produce as well, though they cannot be worked quite as fast. In conclusion, I hope this article on fishing Sarasota Bay helps anglers experience success. Please contact me if you are interested in a Sarasota fishing charter! Anglers can find Florida fishing regulations on the FWC site.